When deciding which career field to go into, there are about as many different choices as there are personalities. However, to narrow down the field, choosing a career usually means putting your best skills to work doing something you enjoy. If you are considering entering a new career field or perhaps changing careers, take a look at the wide variety of opportunities in emergency medical services (EMS). Just to get you started, we’ve outlined 10 very good reasons you may wish to explore the EMS field as a possibility. 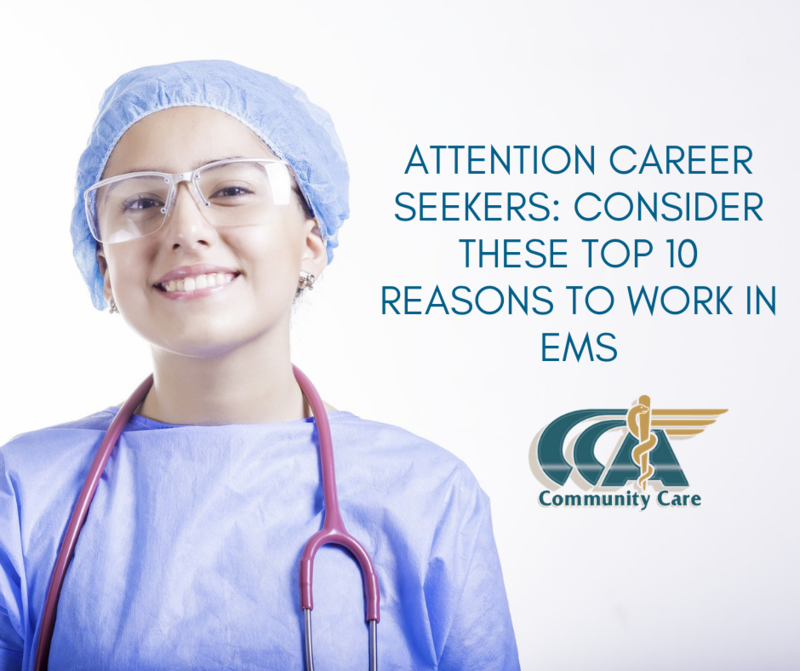 So if you’re a job seeker, consider these top 10 reasons to work in EMS. There are a wide variety of job opportunities in emergency medical services (EMS). There Is Always a Need – As long as there are accidents and emergency situations, there will be a need for EMS workers in all their various capacities. When natural disasters and acts of violence occur, EMS workers are some of the first responders whose presence is always required to treat injuries and potentially save lives. Helping People at Critical Times – Because EMS workers are first responders, they have the opportunity to help people at some of the most critical – and distressing – times of their lives. Often after receiving the critical care they need on-site, the people in these kinds of critical situations are stabilized for treatment. Working Independently – If you are the kind of person who is not fond of having a “boss” check in on you throughout the day, then you may enjoy EMS work. Aside from taking emergency medical treatment advice from an advising doctor, EMS workers are called upon to independently carry out the skills they’re trained to perform. Go Medical without Being a Doctor or Nurse – If you have a strong interest in the medical field but don’t wish to go into the traditional fields as a physician or nurse, EMS work may be for you. 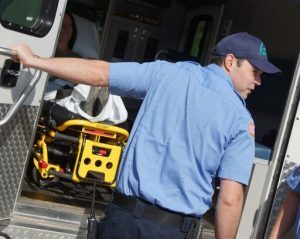 EMS workers not only perform emergency medical services, but also conduct examinations, transport patients, and use the various medical equipment. Shorter Training Time Than Many Other Careers – With basic EMS training lasting as little as 12 weeks and extended levels of training requiring up to two years, overall, EMS training is relatively brief compared to programs for many other professions. That means you can enter your chosen career field in EMS quickly. 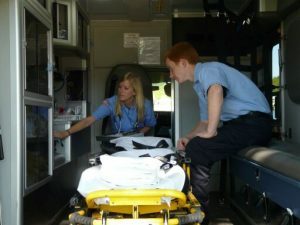 Opportunities for Advancement – Within the field of EMS, there are levels of career advancement that correspond to the amount of training you complete. These include Emergency Medical Responder (EMR), Emergency Medical Technician (EMT), and Paramedic. Lack of Boredom – Nothing is worse than being at a job that seems like it’s repetitive. One benefit of working in EMS is that each day brings new challenges, experiences, and accomplishments based on the changing needs of the people you serve. Gain Perspective – Through EMS work, you will gain the perspective that there are always people with greater needs than yours. This perspective on life helps you gain an appreciation for the position, relationships, and opportunities in your life. Travel/Worldwide Opportunities – Because the situations that call for EMS workers – such as accidents, health conditions, childbirth, and acts of violence – are common throughout the world, the services of EMS workers are needed all over the world, especially in places where EMS training is unavailable or of lower quality. You’ll Do Something You Love – Given the opportunities in EMS and the diverse skill sets required to fill these roles, chances are if you work in EMS, you will be doing something you love. And, you’ll be making a significant difference in the lives of the people you serve! 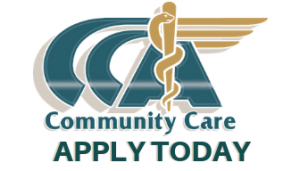 Community Care Ambulance is one of the many healthcare service providers with opportunities for professional and compassionate employees. Call or click today to learn more about employment opportunities in our emergency and non-emergency service areas: 440-992-7302 or www.ccan.org.